Electromigration dispersion is one of several “anamalous dispersion” mechanisms in capillary zone electrophoresis (CZE). It results in strange wedge shaped peaks that appear when sample concentrations are too high. 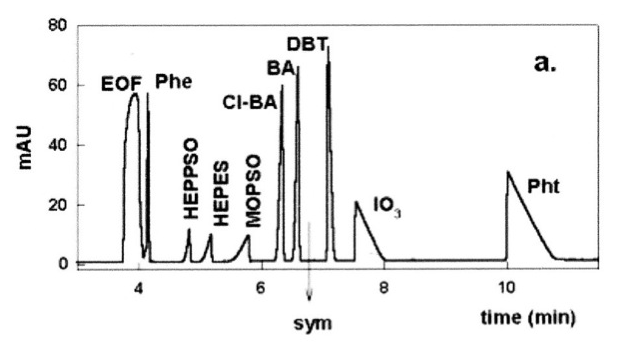 This may be seen in the electropherogram displayed below (reproduced from: Bouskova et al. Electrophoresis 2004, vol. 25, pg. 355-359). The simplest model is a 3 ion system: a sample ion (of either sign) a positive and a negative ionic species. All three species are assumed to have the same diffusivity (D) but they differ in their charge (z,zp,zn) and electrophoretic mobility (μ,μp,μn). All components are considered strong electrolytes (fully dissociated). Using a system of rational approximations, we reduce the system of coupled equations to a single one dimensional nonlinear partial differential equation for the normalized sample concentration ϕ. If the sample concentration is not too large (the weakly nonlinear regime), we show that this equation reduces to Burgers equation. Burgers equation is one of the few nonlinear equations that admit an exact solution for arbitrary initial conditions. The solution is found by using the nonlinear Cole-Hopf transformation to reduce it to the Fourier heat equation. It provides a mathematical description of a wide variety of physical problems: water waves, shocks in gas dynamics, traffic flow on roads, a one dimensional model of turbulence etc. Now we can add CE to this list of applications. Many features of the CE signal may now be understood in terms of the properties of Burgers equation. We show for example that either leading edge or trailing edge shocks are possible, depending on whether the sample valence z lies between the valence of the anion and cation or outside this range. A Peclet number related to the "sample loading" may be defined. We show that a full range of peak shapes from slightly skewed Gaussian to a triangular saw-tooth shaped wave may be generated depending on whether this Peclet number is small or large compared to unity. This research is Supported by the NIH under grant R01EB007596.